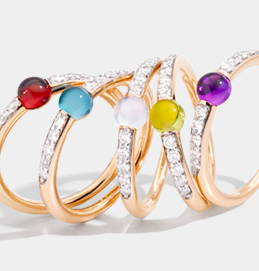 Expressing an avant-garde, original approach, Pomellato’s sophisticated colored stone combinations feature peculiar gem cuts and visionary designs. 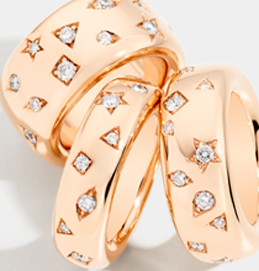 Impeccably crafted, Pomellato pieces have led the brand to embody a modern yet unconventional beauty, immediately recognizable per the Maison’s signature style. 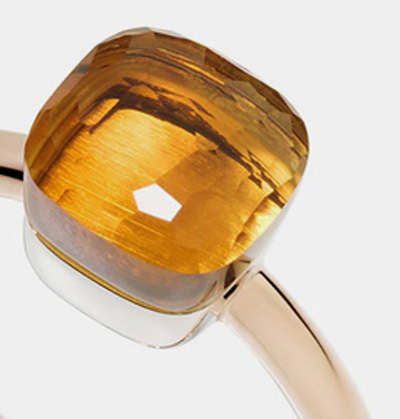 In July 2013, Pomellato joined the Kering Group. A global Luxury group, Kering manages the development of a series of renowned Houses in Fashion, Leather Goods, Jewelry and Watches: Gucci, Saint Laurent, Bottega Veneta, Balenciaga, Alexander McQueen, Brioni, Boucheron, Pomellato, Dodo, Qeelin, Ulysse Nardin, Girard-Perregaux, as well as Kering Eyewear. By placing creativity at the heart of its strategy, Kering enables its Houses to set new limits in terms of their creative expression while crafting tomorrow’s Luxury in a sustainable and responsible way. The Group captures these beliefs in its signature: “Empowering Imagination”. Since its inception, Pomellato has become a communication trendsetter, developing innovative campaigns with famed photographers such as Helmut Newton, Gian Paolo Barbieri, Michel Comte, Paolo Roversi, Javier Vallhonrat, Sølve Sundsbø, Jean-Baptiste Mondino and the duo Mert and Marcus. Toward this end, Pomellato’s 2017 #PomellatoForWomen campaign celebrated its 50th anniversary alongside a strong feminine leadership. Starring several women from an inclusive cross-section of various disciplines, ages, features and arts, they are bearers of Pomellato values, standing united with a confidence in who they are. Shot by Peter Lindbergh, the #PomellatoForWomen trailblazers beautifully encapsulate the forward-thinking, unconventional approach that has defined Pomellato for 50 years.